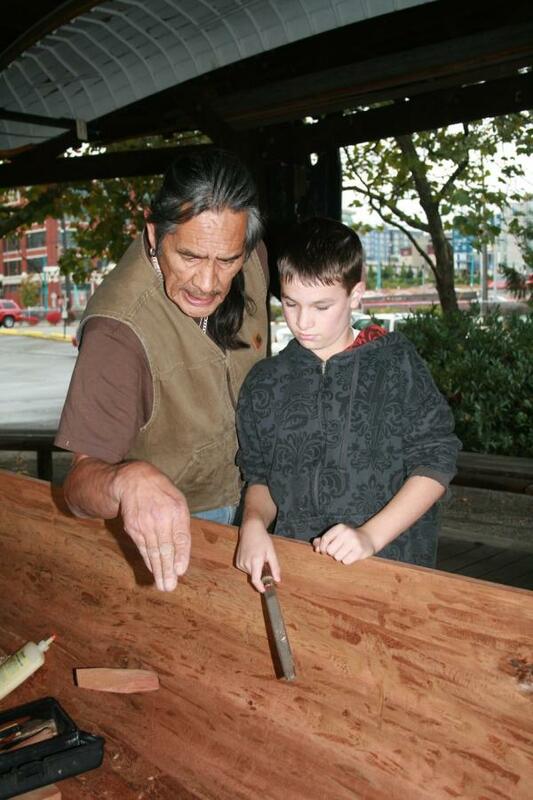 Saaduuts Peele, a Haida master carver, instructs Gabriel Port, a Samish Nation descendant, on a finer point of canoe carving on October 23, 2010, at the Center for Wooden Boats in Lake Union, Seattle. Saaduuts is resident carver at the center, and has carved two canoes with the assistance of local students. Haida master carver Saaduuts Peele was a guest at Pinehurst K-8 School in Seattle, Washington on June 18 for the school’s final graduation ceremony—the school will soon be torn down to make way for a new school. Peele and Pinehurst students carved a 40-foot ocean-going canoe, Ocean Spirit, in 2003-04 and gifted the canoe to the Native community of Hydaburg, Alaska in a potlatch in April 2004. The canoe was returned to Seattle on June 18. Saaduuts, resident carver at the Center for Wooden Boats in Seattle, is doing some repairs to the canoe at the center. Once repairs are completed, the canoe will return to Hydaburg. This entry was posted in Education, News and tagged canoes, Haida, Master Carver, SEATTLE, students by Kim Kalliber. Bookmark the permalink.